Gov. 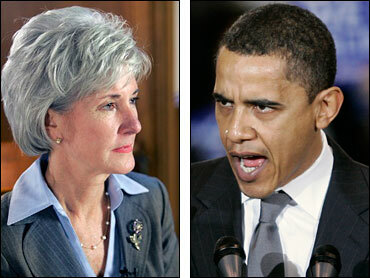 Kathleen Sebelius told The Associated Press on Tuesday that she will endorse Democrat Barack Obama for president. Her announcement came hours ahead of Obama's rally in El Dorado, the hometown of his grandfather on his mother's side, and one week before the Kansas caucuses, which are part of the Super Tuesday contests Feb. 5. Democratic presidential candidates long had sought Sebelius' backing in a state that George W. Bush carried by large margins in the 2000 and 2004 elections. No Democratic nominee for the White House has won Kansas' electoral votes since 1964. But Sebelius, now in her second term, has shown an ability to triumph in GOP territory. She won re-election in 2006 with nearly 58 percent of the vote. In Kansas, less than 27 percent of the voters are registered Democrats. She said her two "20-something" sons and 86-year-old father, former Ohio Gov. John Gilligan, were already backing Obama. Sebelius said Obama had the ability to bridge generations for the betterment of the country. "I think he represents the kind of leader that we need for the future of the country," Sebelius said. "I think he brings the hope and optimism that we really need to restore our place in the world, as well as to bring this country together and really tackle the challenges that we have." Obama chose El Dorado for his rally because it was the hometown of his grandfather on his mother's side. But his campaign has paid an unusual amount of attention to Kansas, opening an office in Lawrence in October and bringing 18 staffers to this traditionally Republican state. Sebelius has won two terms by wooing moderate Republicans and independent voters. Obama hopes to do the same in Kansas, which a Democratic presidential candidate hasn't won since Lyndon Johnson in 1964. Democrats will have caucuses at 50 sites on Super Tuesday to split up 32 of their 41 delegates to the Democratic National Convention this summer in Denver. Sebelius is one of the remaining nine delegates who will represent the state. Her endorsement is important because she is highly regarded within the party nationally. House Speaker Nancy Pelosi has called Sebelius one of the party's brightest stars. Democratic candidate Hillary Rodham Clinton opened campaign offices earlier this month in Kansas City, Topeka and Wichita and has three paid staffers in Kansas. Also, her state steering committee includes Joan Wagnon, Sebelius' secretary of revenue.